The nasal septum is the wall made of cartilage in the front and thin bone in the back between the nostrils and separates the two nasal passages. It helps direct airflow and support the nose. If the bone or cartilage is not right, this will lead to a condition called a deviated septum. It becomes difficult to breathe with a crooked septum. This may also be the reason behind sleep apnea and snoring. You may have to undergo a surgery to treat your deviated septum. Keep reading to find out different things that will help accelerate deviated septum surgery recovery. What Is Deviated Septum Surgery? The procedure to straighten the septum is called submucuous resection of the septum, septoplasty, or septal reconstruction. The surgery involves straightening and repositioning your nasal septum in the middle of your nose, which requires the removal of parts of your septum that your surgeon inserts again after repositioning. You need this surgery to treat inflammation, chronic sinusitis, or bleeding. It also proves effective for the treatment of sleep apnea. Septoplasty may be required to remove nasal polyps and fix other breathing problems. Before surgery, your doctor will use an endoscope to identify the shape of your septum – they may also use endoscope during surgery. The procedure usually takes 60-90 minutes and is performed under general or local anesthesia. A layer of soft tissue called the nasal mucosa is used to line the nasal passages and septum. Your doctor has to work through the nostrils to repair the septum. This involves making an incision to separate the mucosa from bone and cartilage. They replace the mucosa over the bone and cartilage after straightening or trimming the bent cartilage. How Long Does Deviated Septum Surgery Recovery Take? Depending on the complexity of the problem, the recovery time varies from 3 days, with no external swelling and very limited nasal obstruction, to a week or more when you undergo complex septal reconstructions. This picture shows how the nose will be like when it fully recovers from a deviated septum surgery. The result is quite good, so take good care of yourself to help with a good recovery for best outcome. 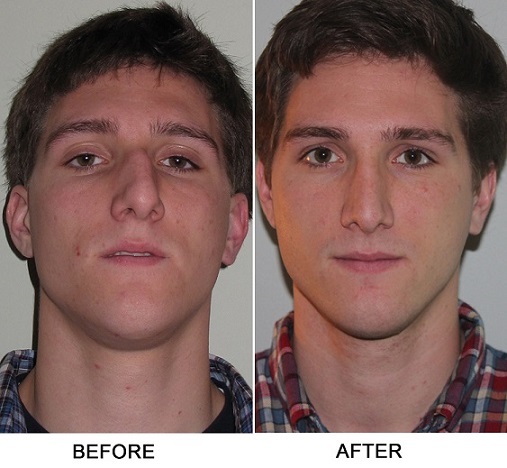 Septoplasty is an outpatient procedure, which means you are good to go home once you are no longer under the effects of the anesthesia. However, depending on the complexity of the procedure, your nose will be painful, swollen, and packed with cotton to prevent bleeding. The packing usually goes away in a couple of days of surgery. It is important to take precautions after surgery and limit your physical activity, including sports, for several weeks to promote healing. Take pain medications if your pain is rather severe. After your return home, you should go to your bed and take plenty of rest. Be sure to keep your head elevated by keeping a couple of additional pillows under your neck. Keeping your head above your heart will help minimize fluid accumulation in the tissues, which in turn will prevent and reduce swelling. You may require assistance to get out of bed for the first few days. Be sure to avoid straining while passing stool or urinating. Ask your doctor to give you a gentle laxative or stool softener to treat constipation. You may have swollen nose, cheeks, upper lip, and eyes for several days after your surgery. It's normal and usually goes away in a few days. You can use an icepack to help reduce swelling. You can simply put a few frozen vegetables in a pack and apply it on your nose and around the eyes to reduce swelling. It is common to experience some bleeding after your procedure but it should resolve in a day or so. Be sure to change the gauze dressing that collects blood only when it becomes saturated. Some people have to change these dressings every hour for the first 24 hours after surgery. You no longer have to use any dressing after a couple of days. Avoid taking aspirin or anti-inflammatory medications such as naproxen or ibuprofen for at least three weeks after surgery. You should resume your work or school only when your doctor says so. It is important to take bed rest for at least a week after your surgery. It is also important to avoid resting your glasses on the bridge of your nose until swelling goes away. Avoid tobacco products and alcohol because smoke can prolong healing. Dust and fumes can also irritate your nose and even lead to infections. It is a good idea to avoid facial tanning for at least six months after your surgery. Be sure to wear a sun block when you go out in the sun. You can use your makeup after surgery. It is important to lubricate your nostrils to avoid hard crusts that develop on healing tissue. You can apply Vaseline with a Q-tip for this purpose. Peroxide also helps a lot in this regard. Take care when brushing your upper teeth because these teeth will be tender and stay numb for several months. You can take certain steps to accelerate deviated septum surgery recovery, and return to your normal activities, including swimming and exercise after three weeks (if you're not having any issues with bleeding). Do not drive for a couple of months and go see your doctor if bleeding occurs. You notice a sudden increase in bleeding that doesn't go away by ice, pressure, and head elevation. You have a fever higher than 101.5F that does not come down even after taking enough fluid and acetaminophen. You have persistent headache or sharp pain that persists even after taking pain medication. You notice your swelling becoming worse with redness of the eyes or nose. So, be sure to see your doctor if you experience any of these abovementioned complications. Mucus in Throat, Hard to Breathe!